Earthborn Holistic Dog Food Reviews, Ratings, Recalls! 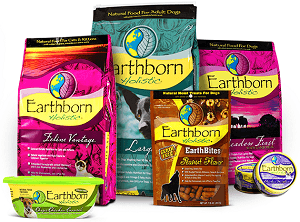 ​Earthborn Holistic Dog Food Reviews, Ratings, Recalls! Earthborn Holistic is a sub-brand of the Pro Pac Ultimates brand. Earthborn Holistic is a brand highly focused on recycling and loving the planet. In fact, its slogan is Love Your Pet. Love Your Planet. All Earthborn Holistic packaging is made in North America through a process that uses natural gas rather than crude oil. And, its manufacturing facilities operate with renewable resources. The brand even uses recyclable materials to create its paperwork used in meetings and its t-shirts for advertising. Earthborn Holistic reviews are pretty solid. Most customers really like this food for their dogs, which is why I didn’t rate it a bit lower. I like to take into account full research on dog food, and that includes the opinions of dog owners who purchase the food. Most customers say their dogs enjoy the flavors of several Earthborn Holistic varieties. Additionally, customers really seem to love the grain-free varieties that have helped their dogs with allergies. I do think the nutrient content, for the most part, is right on target. There is plenty of what your dog needs to thrive. I especially like the added Omega oils and the addition of Taurine and Beta-Carotene that many dog foods don’t provide. The grain-free varieties seem to be quite helpful for dogs with allergies, according to customer reviews. And all of the food varieties have a very good balance of meats, vegetables, and proteins, which is always a plus. Earthborn Holistic also goes to great lengths with its sustainability efforts by turning almost everything about the company into a recycling and green effort. I like brands that try to make a difference, and this effort is a huge one. However, I find myself not liking the ingredients of the food more than I like them. The grain-free varieties have some red flags, as they contain a high amount of carbohydrates to make up for the lack of grains. Potatoes, sweet potatoes, and tapioca, for example, take the place of grains, but are excess carbs unnecessary in dog food. The Adult Vantage variety, one of the most popular for the brand, also has many of the same high-carb ingredients that don’t need to be in dog food. And, the number one source of protein is a chicken meal rather than whole chicken meat. This is definitely not the quality protein I’d expect from a company that markets it as such. Finally, I am more than disappointed with the lack of information on the website itself. There is very little information about Earthborn Holistic as a company. Instead, it mostly talks about its recycling endeavors, which are excellent. But I want to learn more about the company, how it creates its dog food, where its ingredients are from, etc. I learned none of that from its website. The nutrients in this look pretty good, although I’d prefer more protein. If you’re a brand that advertises as having plenty of quality protein in your formulas, you should deliver. And although this fits in with AAFCO minimum guidelines, it’s on the lower end. I like to see protein levels as close to, or higher than, 30%. However, everything else meets the needs of most dogs well. This formula also has several things that many other dog foods don’t include, like Taurine and Beta-Carotene, which can aid in digestion and other bodily functions. As for ingredients, I’m a little on the fence. Chicken meal is the number one protein. Animal meal in dog food is highly debated. Some say it’s a good source of protein comparable to whole meats. Others say it should not replace a full animal meat protein. I say, I’d rather see the whole meat protein rather than meal, which can contain a lot of unknown ingredients, like beaks, feathers, and more. Most of the other ingredients are good, wholesome ones. Apples, carrots, spinach, and blueberries, for example. However, it does have an excess number of carbs from sweet potatoes, potatoes, and oatmeal, all of which are main ingredients. If you’re worried about weight gain, this may not be the best food for your dog. There is no history of a dog food recall Earthborn Holistic in the last two years according to the FDA and Earthborn Holistic dog food reviews. Earthborn Holistic is an exceptional brand in terms of its green efforts in creating an eco-friendlier company than others of its type. It seeks to involve as many as it can in its endeavor to create sustainable products that help the environment. The brand has good reviews of its food, overall. Most customers say their dogs love the flavors and the grain-free varieties have helped their dogs with allergies or stomach sensitivities. However, I’m not so thrilled about the ingredients the brand uses. I see many of them as fillers and cheaper proteins. Although there is an excellent balance of meats, vegetables, and fruits, the overall ingredients aren’t enough to win me over. A better food choice for your dog is Taste of the Wild. It has a healthy balance of ingredients, with high-quality animal proteins as its main protein source. Bravo Dog Food Reviews: The Best Raw Food Diet for Dogs?